...recipe search is over. That's what I mean. I have tried a few recipes and this is the best one yet. This recipe makes the most perfect of perfect cakes. My daughter loves red velvet cake and it has been her choice for her birthday for a few years now. I have been using a different recipe each time I make it because I am still unsatisfied with the outcome. Mind you, it is always "sold out". Maybe I am not a big fan of red velvet cake though I seriously want to be. It is so pretty in looks and in name but the flavour leaves me wanting for more of something that I can't put my finger on. The vibrant red colour probably fools my taste buds into thinking that it has a red flavour. The cocoa is in such a small amount that it doesn't really come out as its flavour. 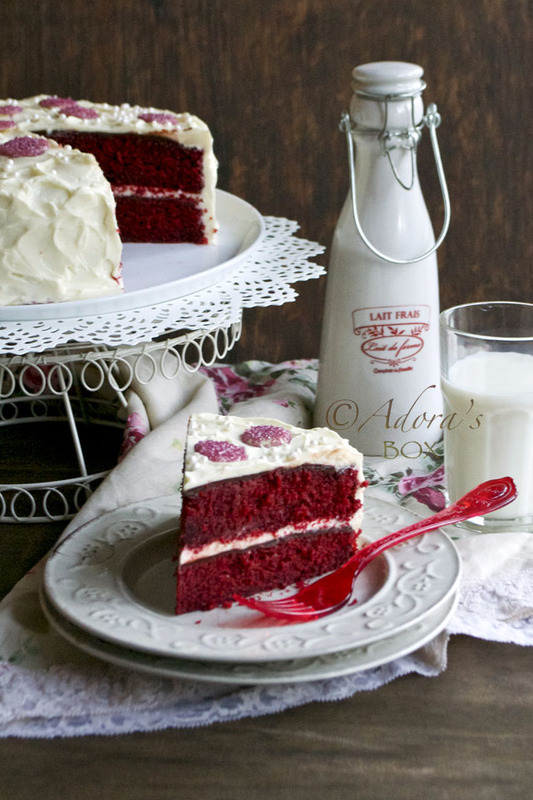 This red velvet cake recipe by Divas Can Cook stood out amongst the rest. I was instantly interested. Their secret ingredient? Coffee! Yes, hot coffee. Cocoa plus coffee equals mocha, right? Not when the colour is bright red. Again, it is the psychology of colours. But never mind what it should taste like, it tastes fabulous! It is very moist and has a lot of flavour. The crumb is perfect. I don't know if you'll approve of what I did next. I know that it already has enough flavour but I really wanted a deeper affirmation of chocolate without adding too much cocoa powder to the cake. I coated the top of each layer with chocolate ganache and that took it to another level of yumminess without diverting the flavour from that of a red velvet cake. In fact it remained unnoticed until I pointed it out. It is that thin line that divides cloud 9 and heaven. Of course the snow white fluffy cream cheese frosting is, shall we say, "the icing on the cake". I used my own favourite recipe for cream cheese frosting and that just tied everything up. All in all, the red velvet cake layers plus the satiny chocolate ganache topped with the creamy cheese frosting makes a cake that's to die for. Cake recipe by Divas Can Cook. Pre-heat the oven to 325° F/ 170° C.
Grease and flour two 9" cake pans. I lined the pans with baking paper. Since it is a moist cake, it sticks a bit so prepare the pans well. In a mixing bowl, whisk the flour, baking powder, baking soda, cocoa powder and salt. Mix the sugar and vegetable oil in another bowl. If using gel food colouring, add it in at this stage. You might want to temper the colour (mine's too red, I think). Add in the eggs, buttermilk, vanilla and food colouring. Stir before adding the coffee and vinegar. Blend everything together. Use a large mixing bowl to combine all the ingredients together. Put about a quarter of the dry ingredients in the mixing bowl. Add the wet ingredients gradually, alternating with the dry ingredients, mixing after each addition just until combined. The batter will quite liquid. Divide the mixture equally between the two prepared pans. Bake for 30-40 minutes or when a cake tester comes out clean. Do not over bake. Invert on cooling racks. When the pans are just warm, run a knife around the edges to loosen the cakes. Invert onto the cooling racks, peel the lining paper off and leave to cool completely. Heat the double cream in a saucepan or in a microwave. It needs to become hot but does not need to boil. Take off the heat and add in the chocolate. Stir until smooth. Refrigerate to cool and thicken. When it is of spreading consistency, it is ready for use. I used both cake layers upside down to make a more level cake. Spread half of the ganache on each cake layer and refrigerate to set before frosting. Note: The fat content of cream differs from country to country. To remedy runny icing: Whip soft room temperature butter (about 1/4 c.) and add in the icing a little at time while whisking. Adding more sugar will make it runnier. Chill icing before using. If using double cream, follow these instructions. Whip the cream until thick and fluffy. Do not over beat. Add in the cream cheese and the confectioners sugar. Whisk again until all combined. Use 1 c. of frosting to fill the bottom cake layer then top with the other cake layer. Use the rest of the frosting to ice the whole cake. Decorate as you like. I used white chocolate buttons which I microwaved for a few seconds. When slightly melted, I sprinkled sugar glitters. I refrigerated this to set. 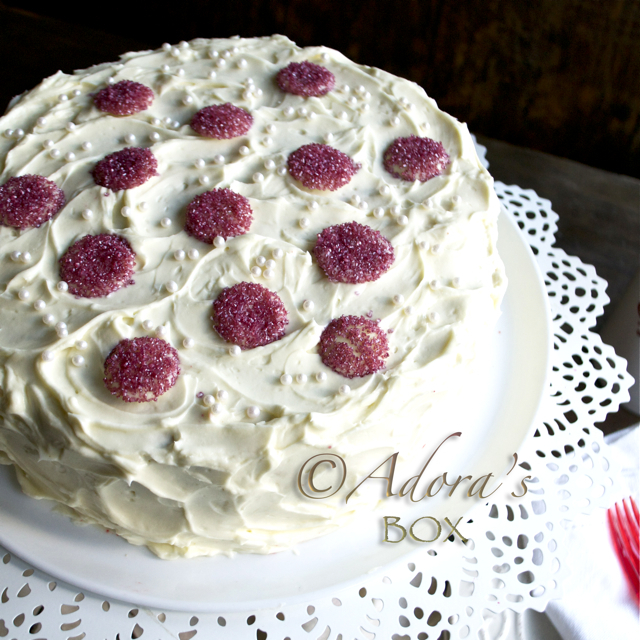 I topped the cake with these buttons and sprinkled sugar pearls. Thanks for dropping by. Please let me know what you think of this post. 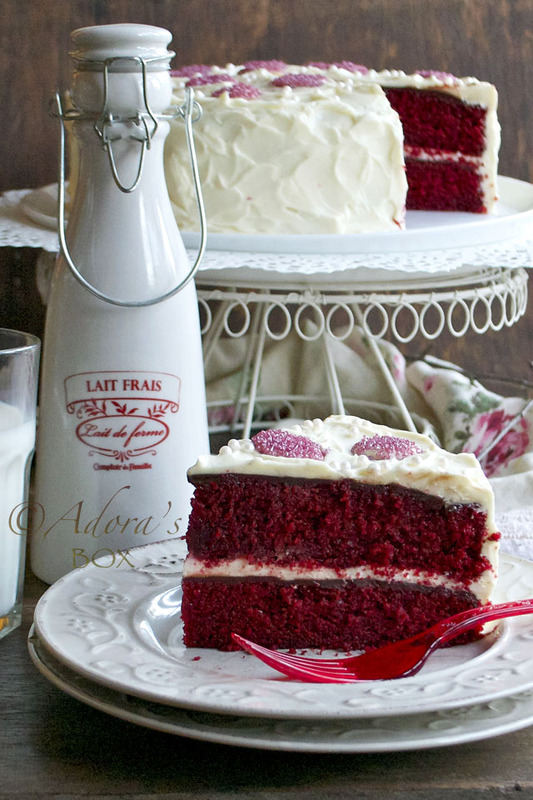 Oh....your red velvet cake is beautiful Adora. The ingredients for this red velvet is different from others... as it added 1/2 cup plain hot coffee! Won't it be too wet with adding 1/2cup? I would like to make this one day....as my b'day cake ...coming soon. Oh, let me have another look at your cake .....oh...so beautiful wish I can have a slice from you. Anymore left? I followed their recipe to the letter and it was wet but that resulted in this very moist cake. You have to try this, Mel! I never understand why everyone is so crazy about Red Velvet cake and always ask me to make it for them. I have not tried anything that would knock my socks off yet. This Red Velvet you made looks great and I will try this recipe and I will let you know. I share your sentiments and that is what drove me to keep trying to find the best recipe. I was sure that I'm missing something. Do try this and let me know. I felt the same way and tried this cake for a friend and it is amazing! This is now my go to recipe whenever I make a cake for almost any occasion. It is so moist and has so much flavour. The chocolate ganache really gives it a nice twist. I use avocado oil which blends in beautifully. Thank you for sharing this! this looks out of this world. when you say double cream, what do you mean? heavy whipping cream, in the US? That will probably be the most suitable substitute for double cream. Hi Katie! This is a simple and easy recipe. I hope you do try it out. Your cake looks beautiful! Have you tried making the recipe for cupcakes? I'd love to give that a try! No, I haven't Paula. The batter is quite liquid and I don't know if that will hold in a cupcake case. A silicone one, perhaps, must be used. Adora, this is so beautiful! Your daughter must have had a happy birthday indeed. I know exactly what you mean about the amount of cocoa in red velvet cakes being insufficient. I believe originally it interacted with some other ingredient to create a red color, but with the use of food coloring these days the small amount of cocoa seems almost pointless. The ganache sounds real neat. Hi Shirley. I know I've already mentioned cloud 9 and heaven but my daughter was over the moon with her cake. I was scared to touch this recipe thinking there must be some science involved. Some recipes don't even have cocoa in them. This one ended up with so much fragrance and flavour, just what I was looking for. The ganache, though very little, gave it a punch and a silky mouth feel. Hi Gio! I followed this recipe to the letter. It turned out perfectly. I guess shortening would produce similar results. The coffee seemed to make all the difference. The other recipes I've tried were not as moist nor flavourful. Thanks Jamie Anne. The ganache is an addition that I would do again. It didn't change the flavour but enhanced it and gave a silky mouth feel. I am a HUGE fan of red velvet cakes (I like the hint of chocolate since I really dislike chocolate cakes and I like the hint of vinegar). 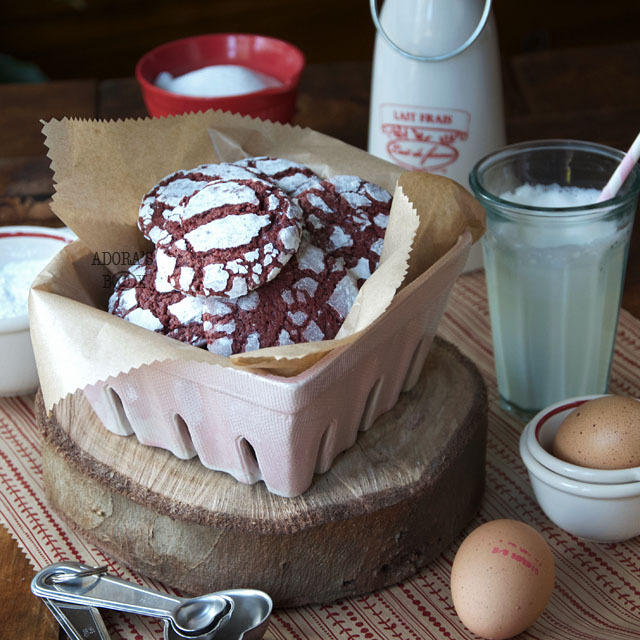 Next time I bake a red velvet cake I am definitely using this recipe, it looks delicious. Hi Brittany! This cake must have been made especially for you. I have made this cake before from Divas Can Cook. Amazing recipes there. Anyway, I saw your cake at tastespotting and had to come check it out. I am super obsessed with Red Velvet Cake. The chocolate ganache is very clever! I will try that next time I bake this cake! I stumbled upon the site from Google search. Thanks for your tip, I will look for more fabulous recipes. Happy birthday to your boyfriend! I hope he enjoys his cake. First of all - Happy Birthday to your daughter!!!! Secondly, like you, I never have been a fan of red velvet cake, or cake in general; however, you definitely took the normal out of this cake with the coffee, cocoa, chocolate ganache and cream cheese frosting. 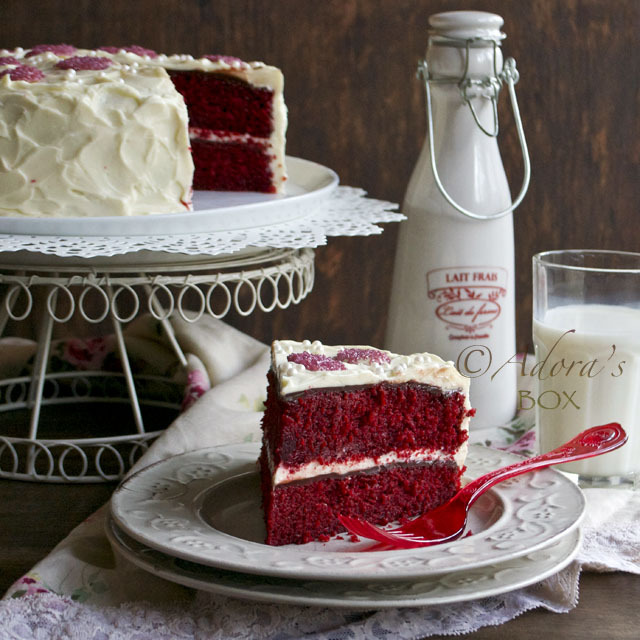 This is definitely not your mamma's red velvet cake! Very, very lovely!!!! AND delicious, I'm sure! Thanks for your comment and greeting MJ. This is the most beautiful red velvet cake I have ever seen! It's so moist. Oh, I want it! I wish I can send you a slice! That red velvet looks like the queen of red velvets. Oh and special mention to the chocolate ganache - just lovely! Although the cake itself is delicious enough, the ganache made a lot of difference. This looks deliciously wonderful! I've thought about making it for a friends birthday! As a side note, what would you suggest as a good substitute for the cream? They are lactose intolerant. Hi Lisa. I'm sorry to say that this cake has, aside from cream, buttermilk and cream cheese also. There are probably some substitutes for these products but I haven't tried any of them myself. This cake looks amazing...I'm a huge fan of red velvet cakes but i'm worried the coffee would make it taste like coffee. The coffee doesn't make it taste like coffee at all, nether does the cocoa powder make it taste like chocolate. I think the combination of all the ingredients gives it the unique red velvet taste. Beautiful cake! And am sure quite yummy! I love Hummingbird Bakery's red velvet cupcakes and their bakery in Notting Hill is part of my weekend jaunts when i do my "fruit/veges" shopping at Portobello Market. Yours is a must try recipe. Hi Jenni! The more sugar added to cream cheese frosting the runnier it gets. Quite the opposite of buttercream. Double cream differs in fat content (what makes it thick when whipped) and we have no way of telling much fat there is. Make sure everything is cold and whip the cream first before adding the other ingredients. If it is too soft (mine wasn't, but then it is cold here), refrigerate first before using. If you think the double cream is not fatty enough, whip about 1/4 c. of unsalted butter then slowly add your cream while whisking, taking care not to overbeat. Add the rest of the ingredients. I hope this helps. Thanks for the recipe Adora! I felt the same way with thinking red velvet cake was so overrated and it was just mediocre chocolate cake in a red disguise. I saw the coffee in the recipe and knew it was different. It was delish. Thanks so much! I jst tried this recipe n made 23 cupcakes with it, I have to say it tastes better then any bought red velvet cake I've ever eaten, g8 recipe many thanks for sharing. 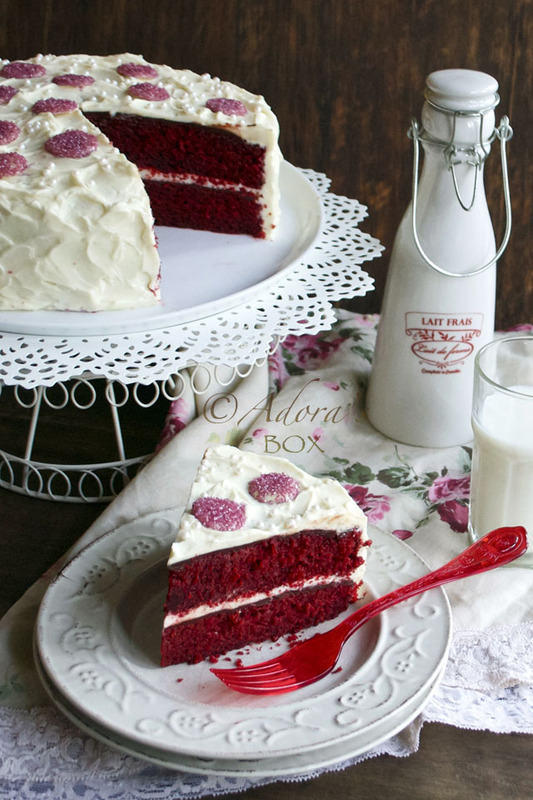 Hi Adora, this is one of the best looking red velvet cakes I have seen! 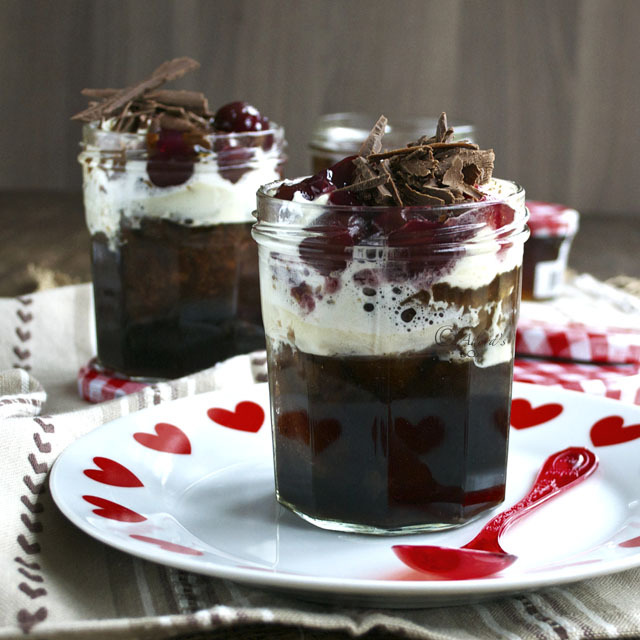 I love the addition of coffee and the chocolate ganache! Hi! I would like to ask about the buttermilk that you mentioned here, is it a liquid butter milk or in powder form? I already bought a powder form butter milk. What is the proportion to have it on a liquid form? I hope that you can help me because I think your cake is delicious and I would like to try it. Thanks a lot! Hi Liezl. I am not familiar with powdered buttermilk. Perhaps the label would have mixing instructions. 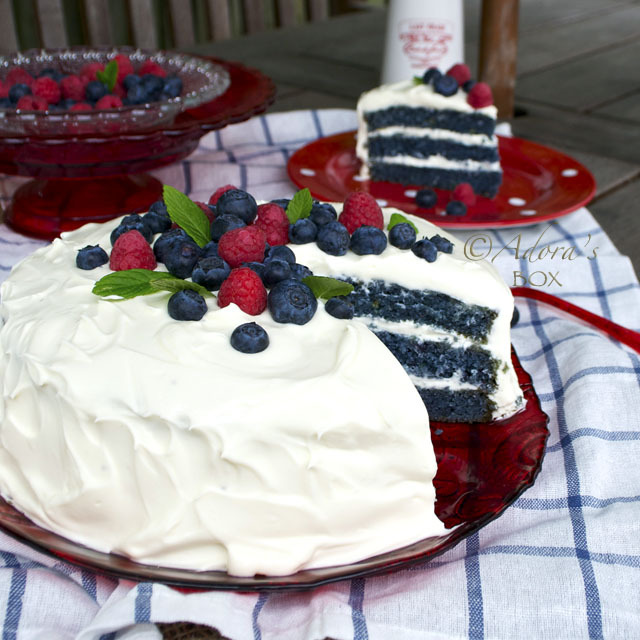 This is stunning, I love red velvet cake too but it's been too long since I made one! hi there, thanks for the recipe! what size should my cake pan be for this cake? Hi Megan. Two 9" diameter cake pans are to be used for this cake. HI Adora, just tried your recipe today and must say that it's the best red velvet cake i've made. definitely a keeper. oh and i made it for a birthday but it's not as stunning as yours. thanks for sharing your recipe. I finally bake the perfect red vekvet cake thanks to you. It was amazing, I even put the chocolate ganage to a test and spread it in half of the cake, and everyone was amaze with cake, but the half with the ganage was exploding good! I just made this cake but I have to say that the coffee was a bit too overpowering for my tastes. The cake was also really dense and I thought it tasted a bit too cakey. I liked the addition of the chocolate ganache but I think I will have to tweak this recipe a bit til I get the consistency that I like. I finally got around to making this recipe, and someone obsessed with red velvet I can say it is freaking amazing! My partner hates cream cheese icing, but with the addition of the double cream, he loved it! Seriously, so yummy. Hi there, does it matter if I bake the entire cake in one cake tin then cut it in half, instead of using 2 separate cake tins? The batter is quite wet and the product is very moist. It might be tricky to split into layers. Hello - is it caster sugar you use? Also, when you say 1/2 cup of coffee, is that approx. 115mls? Hi Sarah, 1/2 c. is 125 mls. in British measurement (which I used). American 1/2 c. would be approx. 115 mls. and wouldn't make much of a difference if used in the recipe. Your friend is so lucky! Thank you! Could you please tell me if the sugar you used is caster sugar? I don't know what the American equivalent is called? The fine sugar used in baking. Thanks! Hi Sarah. Sorry missed that. Yes, I used caster sugar but the original recipe just used sugar, which means granulated. Hi dear, can I use unsalted butter in place of vegetable oil. I haven't tried that but I don't see why not. My hunt is also over! Tried this recipe today and it was sooo good! :) thanks for this! I will try your recipe, as i have tried making red velvet cupcakes and i dont seem to get the taste of what i want ( but all the guests love it). Adding the coffee might help as ive used it for my chocolate cupcake...hmmmm..its worth giving a try...thanks! Was wondering if the coffee taste would be overpowering? Im making this for a crowd who don't enjoy coffee too much ? your take ? Not at all. I used strong espresso and the cake still didn't have a coffee flavour. Vanilla buttercream would be great on this, too. Made this for my brother's birthday - the cake sank towards the end of cooking, then when cooling shrank into the paper I lined the tin with and away from the edges of the tin - so it wasn't round and was very squiggly. The taste was quite good, but it wasn't even red - just a fairly dark brown with a reddish hint to it. Also, I tried to use some of the mixture for cake pops, but they wouldn't hold onto the sticks and just sank down them. Quite disappointing all round really - won't make this again! Can you please share with me the proportions of coffee and water you used for the 1/2 cup of plain hot coffee? Thanks! I used freshly brewed espresso. If using instant I'd say a level teaspoon of coffee granules or powder to a cup of hot water would do. Hi! this red velvet cake looks amazing! The problem is that they don't sell buttermilk where I live... do you know if there's any substitute that I could use? Thanks! 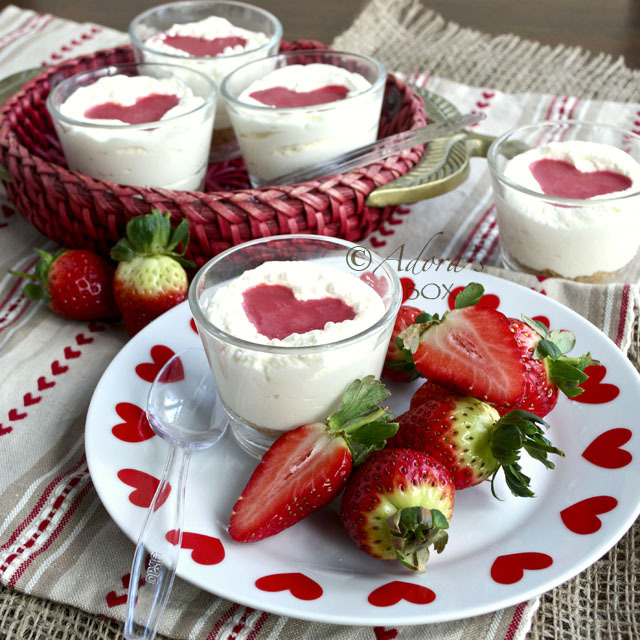 Sour cream or plain (not Greek style) yoghurt may be used instead of buttermilk. You can also make your own buttermilk: put 1 tbsp. of vinegar or lemon juice in your measuring cup and top up with milk. Wait for five minutes before using. If I am not using double cream, do I just add the whipping cream, cream cheese and confectioners sugar until it comes the consistency of frosting? I am a little confused about mixing in the butter. Do I add the room temperature butter to the frosting/icing if it becomes too runny? Yes, just whip the cream before adding the cream cheese and confectioner's sugar. If your icing turns out too runny, whip the butter before slowly adding in the mixed icing while beating. Refrigerate before use. Hi, I am looking for red velvet cakes for a gift to a love one.. Is there a chance that you would consider selling your cake? I am an interested buyer.. :) Are you in Manila, Philippines? Hi, the cake looks fantastic... I would just like to know how strong is the coffe taste in the end, since I really dont like ke it. Thanks! The taste of the coffee is not evident at all. It just blends in with the rest of the ingredients. Don't use strong coffee if you don't like that part. OUTSTANDING!!! Thanks for sharing this recipe. I made 1 1/2 batters for a perfect triple layer 8" round cake and 12 cupcakes. I did not do the chocolate ganache, but used Philadelphia Kraft Cream Cheese filling between the two layers. Since we do not have the Double Cream in the USA, I used the traditional, old-fashioned, cooked Land o' Lakes Whipped Frosting recipe for the icing. Unanimously agreed among ALL that this was the best Red Velvet Cake ever! I tried to make this cake, but it did not work!!!. The coffee should not be put in at all. The filling should be mixed without the cream, then the cream should be added after words, otherwise it's full of lumps as the cheese does not mix into a smooth paste and it does not firm up in the fridge at all. The chocolate ganach does not set in the fridge either. It's very runny, it is just cream and chocolate, it can't get set properly. It's probably better without the ganach. Hi! This is Sam, I was just wondering how many pieces your cake made ( servings)? Thank you! Hi Sammie. This cake would make 8-12 servings. It depends on how big your slices are. OMG i totally get it when you said about the taste, i mean i wanted a much more defined taste too! i tried the recipe from divascancook.com and it was soo good and hell moist, i loved it, but i still did not get the taste i was looking for, maybe because thats how red velvets are, not like mud cake :p so i was thinking of adding more coco powder, but now that you have mentioned about the ganache, i am so going to try this double icing! Did you try with beet reduced juice!!! Thank you for your wonderfull recipe and share with us.. i will try soon.. maybe today evening..
HaI adora..I would really love to try this recipe. but I just wonder if this could make into 3 layer 8inch cake..thanks.. Yes, you can make 3-8 inch layers. Baking time will be shorter. Can can I use cake flour instead of all purpose! Does the recipe need to be adjusted? Can I use cake flour instead of all purpose flour? Does the recipe need to be adjusted? I haven't tried using cake flour. Cake flour contains corn flour/starch hence results to a finer cake texture. I don't know if it is suitable for this recipe. I have never tried making this as a tiered cake. The cake as per this recipe is quite firm/sturdy so a 6" on a 10" might just work. When you make your coffee is it black or does it have milk added? Hi Adora oh I am so glad I found you. I had your recipe long ago and then lost it out of my bookmarks. I've been searching for your blog everywhere and just found it in Google. I know it's the Divas Can Cook recipe but I loved your pictures and I can't tell you how excited I am to find you again. I loved your site and I've made this cake so many times it's a favourite. I knew it was you as soon as I saw the picture of you with the birthday cake. So happy!! !